30 Second Wine Advisor: Tomato season! What to pour? Santa's Summer Sale is here! No billing until December 2007 from The California Wine Club!  Tomato season! What to pour? Summer is going full blast, loading the dinner table with ripe tomatoes and other good things. We look at some wine matches for fresh, light veggie fare.  The California Wine Club! Two wines that sing with juicy, fresh tomatoes and the rest of the garden's bounty: Fèlsina 2005 Berardenga Chianti Classico ($19.99) and De Faveri Rosé Sparkling Wine ($16). We deconstruct wine experts and sketch a deep map of Oregon wine terroir; Dr. Bucko reviews 100 new releases, and next week's Internet radio TalkShoe takes on "unpopular" grapes. In our forums, a discussion of "corked" aromas in household edibles, and a poll on how much help you get from your local wine shop. Tomato season! What to pour? It's July, summer is going full blast in these parts, and yes, I mean blast furnace. Even with the air-conditioning cranked up, it's hard to work up much enthusiasm for firing up the oven and cooking those hearty dishes that seem so appealing in colder times of year. Heck, when the thermometer shoots up past 90F, I even lose interest in the charcoal grill. Fortunately, summer days also mean that the vegetable garden is finally pouring out its annual bounty. Between our own little tomato patch and a wealth of local farmers' markets, there's so much delicious local produce that it's possible to craft a splendid, healthy dinner without turning on the stove. One of my favorite summer dinners is insalata caprese - literally salad in the style of Capri - a simple, memorable combination of the juiciest, ripest fresh tomatoes with fresh basil, fresh mozzarella and rich green olive oil. The original version from Campania (the region on the instep of the Italian boot that includes Naples, Vesuvius and Capri, of course) used dense plum tomatoes; but I like my modification even better, stacking thick slices from a softball-size beefsteak tomato with similarly thick rounds of mozzarella, drizzled with garlicky olive oil, salt and pepper and mounds of finely sliced basil right out of the garden. Eat two or three of these delicacies and you'll feel as stuffed as if you'd dined on real beefsteak, but much more virtuous. But real beefsteak goes great with real red wine. Can the same be said for beefsteak tomatoes? On the whole, light vegetable-based dinners seem better suited for crisp, quaffable whites. But sometimes you just plain want a red, no matter what the thermometer reads. Caprese, in my experience, solves this problem nicely when you pair it with a decent Chianti. Chianti is almost a stereotype with tomato-based pasta sauces because of its crisp, cleansing acidity; and similar principles apply even when the tomatoes are fresh and uncooked. The addition of mozzarella (use creamy, fresh-made whole-milk mozz', please, not the bland stuff that comes from the supermarket in a plastic bag) brings in a second wine-friendly component. And the aromatic fresh basil brings a third synergy to the party, highlighting the light herbal character that's typical of Chianti and other Sangiovese-based reds. Just about any decent, young Chianti or Chianti Classico will do, like the Fèlsina 2005 Berardenga Chianti Classico featured below, although I might save the wood-aged Chianti Classico Riservas for a Tuscan steak or winter beef roast. Another great option with just about any summer veggie dish or salad including Caprese is Prosecco, the light, crisp and frothy sparkling wine from the Veneto that's a favorite summer sipper. 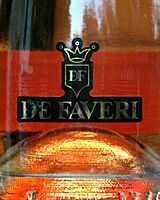 Today's second tasting features De Faveri Rosé Sparkling Wine, a pink sparkler that's made in the Veneto from Prosecco grapes but that doesn't claim the Prosecco label, perhaps because of the splash of juice from the rare Raboso grape that's added to give it color. No billing until December 2007 from The California Wine Club! Santa's Summer Sale is here and it's one of the most popular benefits of The California Wine Club! Reserve your holiday gifts now and receive no billing and no shipping until December 2007 plus receive our lowest prices of the year! Take the stress out of the holiday season and reserve your gifts now with The California Wine Club. Visit www.cawineclub.com or call 1-800-777-4443 for details. You'll save up to $89 per gift, plus there will be no billing and no shipping until December 2007. When you order three gifts or more, The California Wine Club will uncork a special gift just for you! FOOD MATCH: Surprisingly well paired with Insalata Caprese, the Italian summer salad of fresh tomatoes, mozzarella and basil. Fine of course in more traditional matches including rare steak and tomato-based pasta sauces. FOOD MATCH: Perfect with a summer vegetable risotto loaded with yellow summer squash, fresh Roma tomatoes and sweet onions. When people address John Juergens as a wine "expert" or, worse, a "connoisseur," he responds that he's really just a "common sewer" of wine. His rule to live by: Drink what you like. Appellation laws identify wines based on where the grapes are grown. Correspondent Donald A. Dibbern surveys appellation systems in general and Oregon's layout in particular. While we're beating the heat with summer sippers, don't forget the robust red wines that can stand up to a plate of barbecue. In his monthly report, Randy "Bucko" Buckner offers 100 new wine reviews. If you fancy Mourvèdre, Carignan, Cinsaut or even more "unpopular" varieties, you'll want to tune in our live Internet Radio TalkShoe next Saturday, July 14, at 1 p.m. US EDT (10 a.m. on the U.S. West Coast and 19:00 in Western Europe). Last weekend, the TalkShoe featured Old World and New World Pinot Noir. It's now available, with all our archived editions, in streaming audio online.  WineLovers Discussion Group: My bread tastes ... corked! A host of nasties including TCA and its precursors, chlorine, mold and mildew can create aromas reminiscent of tainted or "corked" wine in many household edibles. Join the conversation in our WineLovers Discussion Group.  Netscape/Compuserve Community Poll: How helpful is your local wine shop? Can you rely on the staff at your local wine shop to advise you intelligently, or do you duck out of sight when you see them coming to avoid being touted to the wine they're trying to dump this week? Rate your local in this week's CompuServe/Netscape forum poll, and then take a moment to tell us about your local retailers and how they stack up.